Get them before they are gone! Leather SAP Gloves. 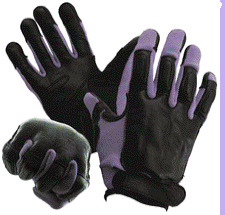 These leather and fabric sap gloves have steel shot sewn into the knuckle area. This protects your knuckles and provides extra mass on your hand to land more effective blows. Why do boxers wear gloves? To protect their faces? No, to protect their hands and keep them from breaking. Great for bouncers and similar contact encounters. These are not for punching a bag, but only for occasional contact work. Also adds weight to your hand when training for conditioning. Not for sale to MA, CA or NY.